In previous posts I described modeling a tripod as torsion spring, and demonstrated the validity of that approach. In those posts though, I was only looking at vibrations about the vertical axis, corresponding to the camera pointing left and right. Here I want to take those same methods and look at tripod rigidity about a radial axis, centered about the tripod’s apex. This is the vibrational motion that results in the camera’s image oscillating up and down. The geometry of the tripod about a radial axis is very different than about the vertical axis. For oscillations about the vertical axis, the tripod twists back and forth with the feet staying planted and the legs bending. About a radial axis, oscillations require either compression of the legs or for the legs to splay out and then back, moving the feet. These are more difficult motions to induce, and we should expect the stiffness of the tripod to be much higher about this axis. This measurement was done on the same Really Right Stuff TFC-14 tripod that the first axial torsion spring test was done on. That test showed an axial stiffness of . Here we can see that the radial stiffness is nearly four times higher, at . This results in an oscillation frequency nearly twice as high and most importantly, angular deviations nearly four times smaller than we would see compared to the same forces about the axial direction. The damping constants for the two directions are similar, indicating that vibrations would take similar amounts of time to die out. There are still some unresolved questions. Most importantly, while there is only one axial axis for there to be rotations about, there are multiple radial ones, infinite in fact. And, since the tripod has three legs and therefore doesn’t have rotational symmetry, we should expect the dynamics to be different depending on how the camera or my measuring apparatus is oriented with respect to those legs. This will be the subject of a future post. Here though we have shown that on one tripod at least, the radial stiffness is indeed much higher than the axial stiffness. 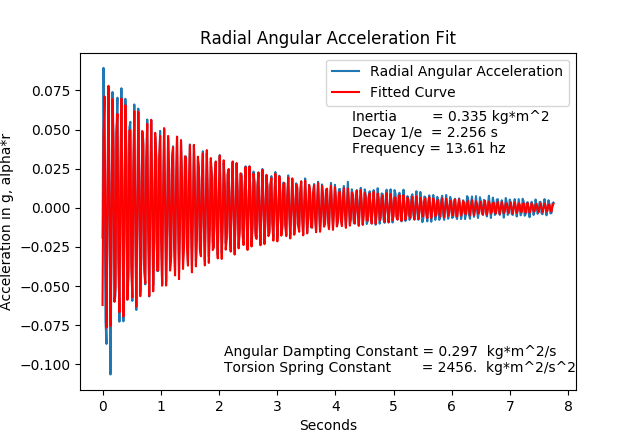 We have also shown that the torsion spring framework applies well about a radial axis as well, and such measurements will be included in the future.